Constance Rea, painter, born in London as Constance Halford. An artist in her own right and listed in Benezit as ‘Halford’ who lists her debutante at The Royal Academy in 1892. She married the well known painter Cecil Rea (1861-1935), whom she had married and began using the surname ‘Rea’ by 1895. She is listed as ‘Rea’ in ‘The Years Art, 1895’, her address was 53 Beaufort St. Chelsea, London. In 1921 her address had changed to Garden Lodge, Logan Place, Kensington, W8. She was a member of the Society of 25 Artists and her work is typical of the atmospheric style popular at that time. 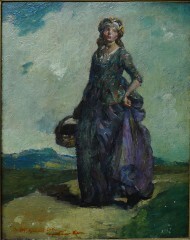 She exhibited 191 paintings in Britain with 27 at the Royal Academy, 27 at The Fine Art Society; 28 at the International Society and others at Liverpool, Society of Women Artists and the Glasgow Institute among others. Although no dates are found for birth or death, she had died before 1929 (but after 1928, see Exhibition list) her husband was living at Garden Lodge, Logan Place, and a member of the Chelsea Arts Club. The Royal Academy in 1892. The International Society of Sculptors Painters and Gravers ,Grosvenor Gallery.